One of the most innovative ways to lose weight and give your body a sculpted and more attractive look is through cosmetic injection lipolysis or fat injections. Injection lipolysis involves decreasing the fat cells from a particular part of your body using deoxycholic acid. This chemical is particularly helpful in disrupting and destroying unwanted fat cells from the injection site. Fat injection, on the other hand, are aimed at removing wrinkles and improve sagging skin. The cosmetic procedure is minimally invasive and requires removing your fat (usually from your thighs, buttocks, etc) and then injecting it into a region which has wrinkles due to loss of volume, such as your face, hands, breasts and buttocks. This is a proven and effective cosmetic procedure to restore a youthful contour to your ageing body, with long-lasting results. When should I undergo Injection Lipolysis or Fat Injection? These are the several conditions that can be resolved with injection lipolysis or fat injections. Have stubborn fat deposits that are not removed through rigorous dieting and exercising. Wish to remove small amounts of fat from certain areas of your body, such as tummy, sides, upper arms, chin, etc. Wish a non-surgical alternative for fat removal of smaller amounts. Wish to remove fine lines, wrinkles and deeper furrows from your face. Wish to restore volume to certain parts of your body, such as breast, buttocks, hands or face. Want to undergo a safer, approved and effective alternative to extensive anti ageing cosmetic procedures. You have sufficient elasticity remaining in your skin. Your skin is not excessively loose. You have a positive and realistic outlook towards the end results of this cosmetic procedure. Need to have sufficient amount of fat in the donor area (where the fat is procured from) to be enough for use as a filler. Do not have any underlying medical condition which may worsen from removal of fat. Have a circulation system which is working efficiently. Have realistic expectations with the end results. What happens in Injection Lipolysis and Fat Injection procedures? Injection lipolysis and fat injections are classified as minimally invasive cosmetic procedures, as these require using only syringes. In injection lipolysis the aim of your cosmetic surgeon is to inject deoxycholic acid into the targeted areas of your body which carry unwanted pockets of fat. Before beginning the procedure, the cosmetic surgeon will administer local anesthetic so that you are not aware of any discomfort while the procedure goes on. The acid works efficiently to restrict the growth of fat cells, and also accelerates their life cycle. This helps to destroy unwanted and stubborn fat cells from your face, hands, breasts and buttocks. As there are no incisions, the recovery time is remarkably less. The surgeon will advise you when you can it is safe for you to resume normal everyday activities depending on the location and the areas that have been treated for fat removal. In the cosmetic fat transfer procedure, the cosmetic surgeon aims to remove your own fat and transfer that fat to an area which lacks in volume, resulting in saggy, wrinkled skin. This is an efficient, convenient and effective anti ageing solution. In this, the surgeon will administer local anesthesia to the sites from where the surgeon will remove the fat (donor site) and where the removed fat is to be transferred (recipient site). This helps to numb your skin and prevents you from feeling discomfort or pain during the short procedure. Once the anesthesia takes effect, the cosmetic surgeon will begin to remove the excess fat from your tummy or thigh. Once sufficient amount of fat has been procured, the surgeon will then carefully inject this fat in areas which lack tissue volume underneath your skin. This fat can be transferred to restore lost volume and shape of breasts, hands and even your facial features. This is a completely safe and convenient cosmetic procedure that helps to restore a fuller, youthful look to your face and hands. 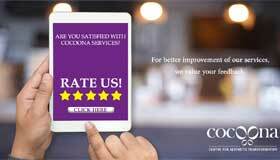 Choose Cocoona Center for Aesthetic Transformation to ensure that you get the best, most reliable and most affordable cosmetic injection lipolysis and fat transfer procedure in India. With a team of highly experienced aesthetic specialists and cosmetic surgeons, we at Cocoona provide world-class cosmetic anti ageing treatments.